After a problematical few days, conditions were finally perfect for practice at the 2015 Isle of Man TT Races, fuelled by Monster Energy, with blue sky and sun all across the Island. At 6.22pm, the solo session got underway with Michael Rutter and Dan Kneen first to leave the line with both, like the majority of the front runners, eager to put in as many laps as possible on their Superbike machines. Guy Martin, James Hillier, Bruce Anstey, Gary Johnson, Ian Hutchinson, Ivan Lintin, Ryan Farquhar, Keith Amor and Cameron Donald followed in quick succession with Lintin the exception to the norm on his Supersport mount. Martin was first to complete a lap at 127.277 but Hutchinson was quickest at 127.967. 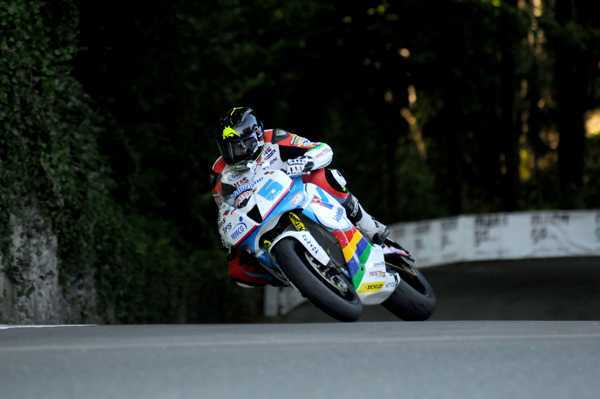 Johnson was the only other rider over 127mph but Anstey, Hillier and John McGuinness were all over 126mph with Conor Cummins and Rutter both over 125mph. The two Dunlops both pitted with Donald switching to his Supersport machine but the majority of riders went straight through and it was Anstey who posted the best lap at 128.641 as he overhauled Hutchinson on the road, the latter lapping at 128mph also. McGuinness got closest to Anstey's lap though with a speed of 128.596mph with Rutter and Cummins also impressing with 127mph+ laps. Meanwhile, Jamie Hamilton, David Johnson and Lee Johnston were all over 125mph. Last year's Junior Manx Grand Prix winner Andy Lawson was also going well with a 122mph+ lap. The majority of the riders switched machines for their third laps and Anstey went to the top of the Supersport leaderboard with a lap of 123.388mph ahead of Ivan Lintin (121.39) and Russ Mountford (121.15). 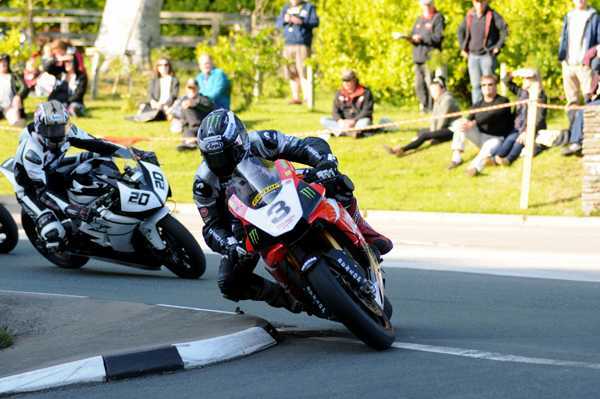 Hutchinson continued on his Superbike though and recorded another 127mph+ lap but Michael Dunlop's second lap was only 124.519mph and he then encountered trouble with his Superstock mount, stopping at Greeba Castle. 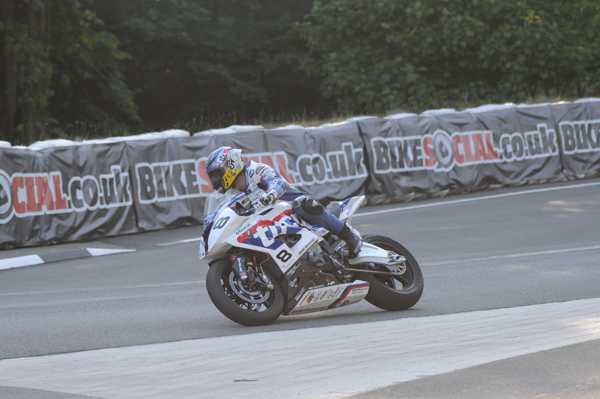 The Northern Irishman did get back out on his 600cc Yamaha as did many of the other riders and Anstey went quicker at 125.218 with Martin and Gary Johnson slotting into second and third at 123.082 and 121.678 respectively. Indeed, many got five laps in as they took full advantage of the good conditions. After a delay due to a serious incident at Sulby Crossroads towards the end of the qualifying session in which French rider Franck Petricola lost his life, the F2 Sidecars got their first session underway at 8.11pm. They were led away in numerical order by Dave Molyneux/Ben Binns, Conrad Harrison/Mike Aylott, Ben and Tom Birchall, Tim Reeves/Patrick Farrance and John Holden/Dan Sayle. Molyneux was the first across the line at 109.888mph but Holden was right in his wheel tracks and comfortably quickest at 112.781mph. The Birchalls were third at 109.221mph but Harrison struck problems and only managed a speed of 99.612mph whilst Reeves failed to complete the lap. Molyneux improved second time around to 110.44 with Birchall also over 110mph. Newcomer Peter Founds also posted an impressive lap at 100.96. Following an incident during the sidecar session at Ballaspur, driver Brian Kelly was taken by airmed to Nobles hospital but was reported to be conscious and was confirmed to be OK following assessment while newcomers Terry O'Relly/Aidan Browne were also reported OK after hitting bales at Governors Dip.